Taylor Lewis and Bethany Marie Anderson were united in marriage on July 14 in Columbus. COLUMBUS — Bethany Marie Anderson and Taylor Lewis were united in marriage at 3 p.m., July 14 at Trinity United Methodist Church in Columbus. Reverend Katy Wheat officiated the double-ring ceremony. The bride is the daughter of Mr. and Mrs. Jeffery Anderson of Clayton. The groom is the son of Mr. and Mrs. Jeffrey Lewis of Upper Arlington. The maid of honor was the bride’s sister, Kelsie Anderson of Columbus. The bridesmaids were Susanne Schott of Denver, Colorado; Sarah Beinkampen of Cleveland; Cathy Rarick of Brookville; Danielle Dickman of Gonzales, Louisiana; and Malory Spicer of Columbia, South Carolina. The bridesmaids wore floor-length navy blue gowns. The best man was Jason Lantz of Columbus. Groomsmen were Evan and Chad Lewis, the groom’s brothers, of Upper Arlington; Joel Anderson, the bride’s brother, of Columbia, Tennessee; John Veltri of Chicago, Illinois; and Charlie Calhoun of Columbia, South Carolina. The bride wore an ivory A-line silhouette gown with an illusion neckline, applique covered bodice and cap sleeves, and illusion back with tulle-covered buttons. The belted waistline flowed into a full skirt adorned with appliques of lace on English net with a wide lace border and chapel-length train. The single-tier fingertip veil was trimmed with a delicate edge of crystals and pearls. The bride carried a garden-gathered hand-tied bouquet of blush pink garden roses, mauve lisianthus, ivory roses and ranunculus surrounded by soft eucalyptus greens. 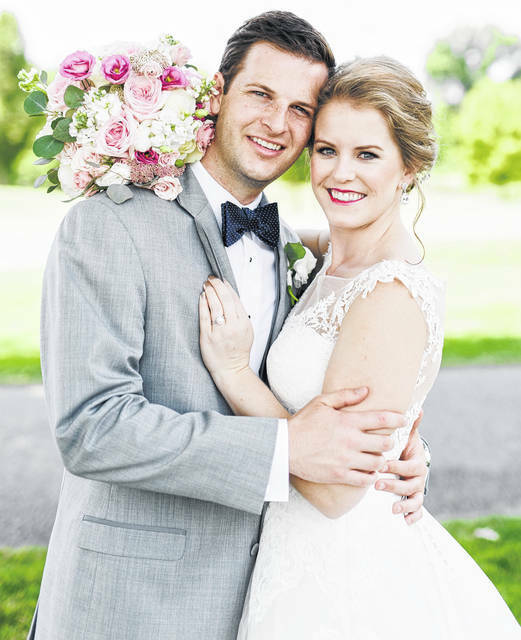 After the ceremony, a wedding reception was held at Wedgewood Golf and Country Club. The couple enjoyed a ten-day honeymoon in St. Lucia. Both the bride and the groom are 2013 Miami University graduates. Bethany earned her Bachelor of Science Degree in Accounting and is employed as a manager at KPMG Columbus. Taylor earned a Bachelor of Science Degree in Education and is a middle school history teacher in the Westerville City School District. The newlyweds now reside in Gahanna, Ohio.